Lemax Village Railway Signal Light Set of 2 depicts two individual metal effect railway crossing signals, to compliment your miniature village display. Scaled and themed for placement in and amongst a Lemax miniature village street scene or in a railway scene such as Starlight Express or the Lemax Yuletide Express. 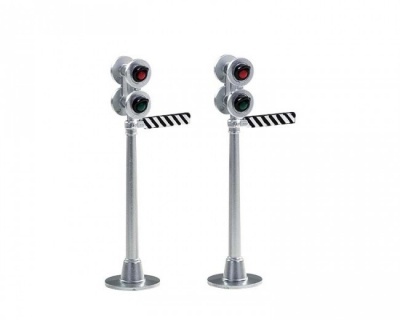 The railway stop signs are of plastic construction and self standing. These modern railway light signals joined the Lemax Village collection in 2017.